Roy Underhill has been teaching woodworking for more than 30 years. As the host of this how-to series, Roy demonstrates how to make bookcases, chairs, puzzles and toys. If it can be made out of wood, Roy knows how to do it and what tools to use. 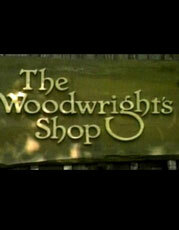 Full of tips and different techniques, "Woodwright's Shop" also features guest craftsmen for unique projects, all using classic hand tools.